Today is National Salad Day. Would I make that up? Actually I got several emails reminding me about it. I was going to post a vegetable salad when I realized, it was also an all local dish which fits nicely with the One Local Summer event where participants make one meal a week with local ingredients. It’s an early version of a recipe I made for my recipe development client. The vegetables–zucchini, corn, peppers and eggplant all came from Capay Organic, the lemon from Los Gatos and the olive oil from Napa. Voila! One local Summer Vegetable Salad. I served it with Sonoma lamb chops. While the idea is to eat at least one local meal a week, I actually had another meal that was primarily local this week. Ok, the rice and spices weren’t but the Spicy Eggplant and Tomatoes dish had Capay Organic eggplant and Greenbrae backyard-grown tomatoes. Delicious stuff and so fresh tasting. I got the recipe from 5 Spices, 50 Dishes, a terrific book written by local food writer and cooking instructor Ruta Kahate. Last week I posted an interview with Ruta over at Bay Area Bites. This week you can read my review of her book and see a recipe for a scrumptious beef curry. The recipe for my One Local Summer Vegetable Salad is as easy as it is versatile. Serve it as a salad or a side dish. I could see adding some crumbled cheese to it and calling it a main dish, and any of the vegetables could be swapped out for something you prefer–tomatoes, patty pan squash, red onions, whatever you like. Change up the dressing too if you prefer something different. Cut and core the bell peppers into 1 – 2 inch pieces. 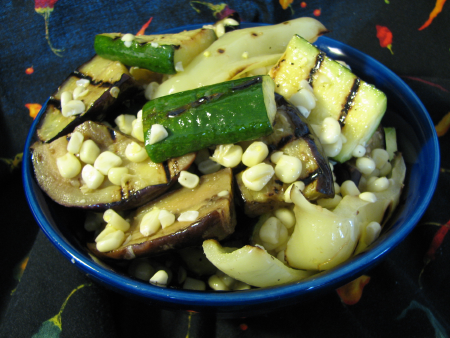 Cut the zucchini and eggplants lengthwise into three strips then cut each strip into 1 -2 inch chunks. Toss the vegetables with olive oil, salt and pepper and grill for 8 minutes over a charcoal grill or in a cast iron grill pan, turning once. Cook the corn on the grill for 20 minutes (husks will burn) then husk and slice kernels off the cob (or husk the cobs, wrap in foil and bake at 375 degrees for 20 minutes) Toss all vegetables with the dressing and warm or at room temperature. I tried this dish last night and it was a great success. This dish took a lot more time than I normally spend on a side dish but my mother-in-law was bringing a honey baked ham. I had the time since they were going to be kayaking and fishing on the lake while I cooked. Fortunately I had a large grilling basket my wife gave me a few years ago. There are a lot of vegetables to cook. I prepared a hot grill to cook this dish. I combined these dishes with the always popular crispy oven baked potato slices. The combination of flavors was interesting. The garlic I add to the potato slices complemented the flavors in the ham and vegetable dish. I followed the vegetable recipe except I used fresh lime juice and I added a little bit of sun dried tomatoes. Adding those ingredients was a little bit inspiration and a little bit of cupboard cleaning but it worked. One young person proudly proclaimed to their mom that they ate all of the vegetables and she does not eat tomatoes.